BREAKING: Obama BUSTED In BILLION DOLLAR SCANDAL- LOCK HIM UP! It seems more abuses of American taxpayers are coming to light from the Obama administration as the Trump administration continues to audit various government agencies for efficiency and cost cutting measures. A large error has been discovered in regards to social security benefits where illegal aliens received over $1 BILLION in benefits paid to them. 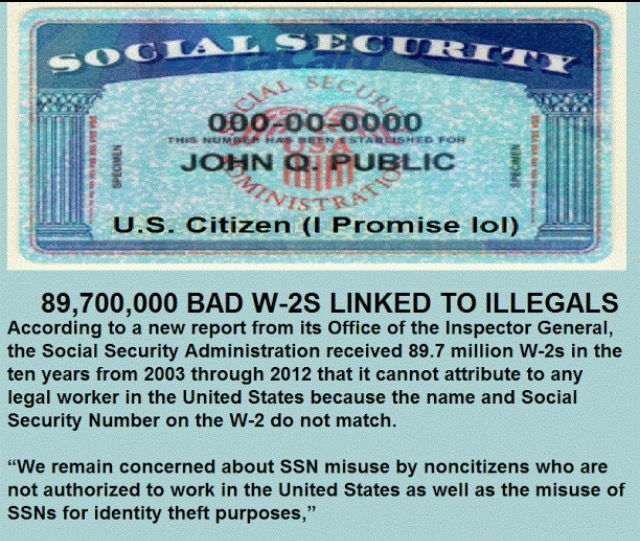 The audit revealed that errors occurred because the agency did not keep paper applications supporting an individual’s case to receive benefits, resulting in more than $1 billion in benefits to individuals who did not have a Social Security Number (SSN). According to the results of the audit, the inspector general found additional errors in the government’s documentation for representative payees. Representative payees are also known as individuals who receive retirement or disability payments on behalf of another person who is incapable of managing the benefits themselves, an elderly person with Alzheimers or dementia for example. The audit results found thousands of cases where no SSN was on file. Since 2004 the agency paid $853.1 million in benefits to individuals who had been terminated as representative payees by the agency and the audit further revealed that a measly 6% of representative payees had SSNs that were properly recorded. A mere 6% were correctly documented – if you or I performed in such a fashion we would have been terminated and rightfully so! It was also discovered that illegal aliens were also benefiting from the representative payee system with 17% of representative payees being shown with no SSN recorded did not have one available due to their status as illegal aliens. Illegal aliens without SSNs are allowed to receive benefits from the government when acting as representatives for their minor children. “Representative payees play a significant role in many beneficiaries’ lives. We have approximately 5.7 million representative payees managing annual benefits for approximately 8 million beneficiaries. When appointing representative payees, we adhere to guidance in the Social Security Act. Specific to this audit, the Act permits us to appoint, in certain circumstances, an undocumented alien, or applicant who resides outside the United States without a SSN to serve as payee. Specifically, the Act states we should verify a person’s SSN (or employer identification number) in our investigation of the payee applicant. However, the Act does not state that the applicant must have an SSN to serve as a payee.